An open-source project that develops standards and software for connecting Lojban with the Semantic Web. What is Lojban? Lojban is an artificial spoken and written language based on predicate logic. It was designed as a human language, but is easily processed by computers due to its unambiguous syntax. You can find a complete description of the language on the Lojban web site. There is also an active Lojban discussion group. In Lojban, the word "jorne" is the predicate that describes the process of "joining" or "unifying". What is the Semantic Web? The Semantic Web is the next-generation web, a web where links are made between concepts, rather than documents. The main standard that defines these links is called the Resource Description Framework (RDF). (See the Wikipedia definition for more information). 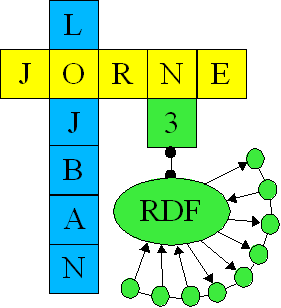 "This RDF element is described by the following Lojban utterance"
"This RDF element is described by the Lojban text in the following URI"
Query the Semantic Web with Lojban questions. Ask about anything on the Semantic Web, and get an answer in Lojban. Develop intelligent agents that read, write and speak Lojban. What is N3 and why use it? N3, or Notation 3, is a shorthand syntax for creating RDF triples. It is easier than RDF/XML for beginners to learn, and easily maps onto Lojban bridi structures. The W3C is the standards body that created the RDF and N3 specifications, and has an excellent tutorial on N3. What are some standards that the project will create? We plan to create an RDF vocabulary and ontology for Lojban, so that anyone can use Lojban semantics from within an RDF document. Other goals of the project include creating APIs for automated translation of Lojban to and from data in the Semantic Web. Initially, the project plans to use existing open-source Java APIs, such as JENA for working with semantic web content, and JavaCC or Rats! (a PEG parser) for parsing Lojban syntax. How can I help? You can join the project through our Sourceforge page.